Character Counter. User agreement and copy terms. The calculation of duration of your text, number of characters and words. 5 points of the user agreement. 1. 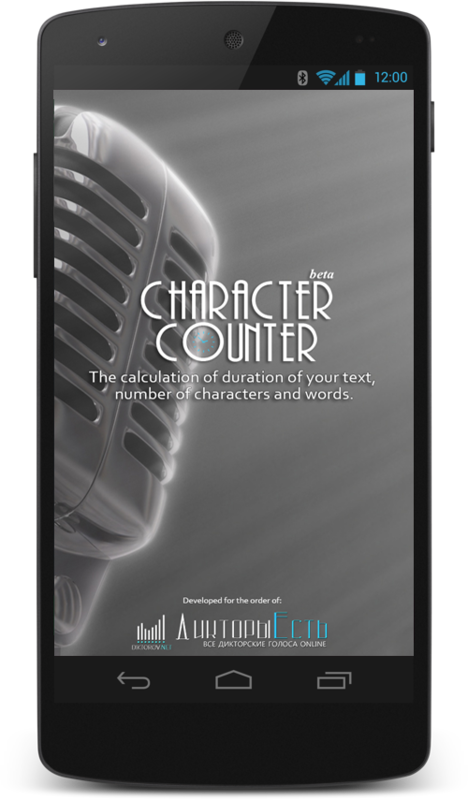 The application Character Counter is absolutely free! 3. Using the "Get text to email" forbidden to spread incitement to violence or incitement of ethnic hatred, spam and disrespectful attitude to the recipient. 4. The application Character Counter can not be sale (or resale) by anyone. 5. Installing the application Character Counter, the subscriber agrees to receive the newsletter service developer updates (not more than 1 time per month). All information on this site is provided for informational purposes only. Copying and distribution of applications "Character Counter" is permitted only by reference to the source. Official web Online voiceover base "Diktorov Net"
Прочитать пользовательское соглашение на русском языке. Online voiceover base "Diktorov Net"
Mobile application "Character Counter" is royalty free.